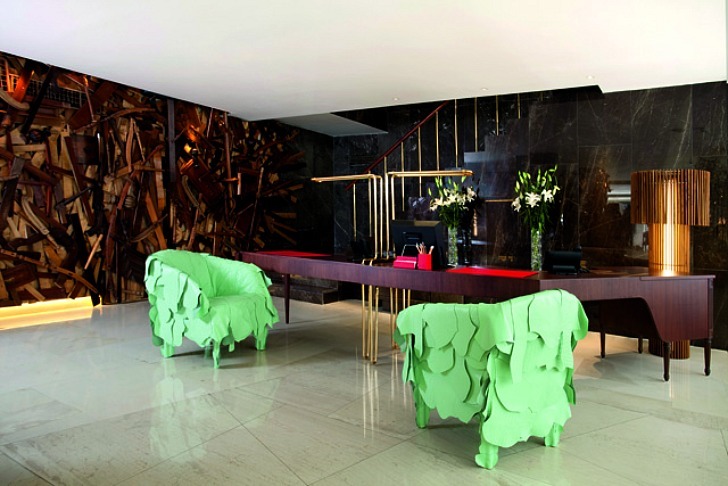 Can't you almost hear the sultry Brazilian music pulsing through the lobby of this eye-popping New Hotel upgraded by the Campana brothers? The colorful depth and flair of the new accommodations in Athens rival the most flamboyant designs featured on Inhabitat, and yes, we're definitely talking serious recycled and reused goodness. The Yes! Hotel chain opened the refurbished lodgings at the beginning of July within the former Olympic Palace Hotel, which is situated within minutes of many of Greece's most famous historical sites. 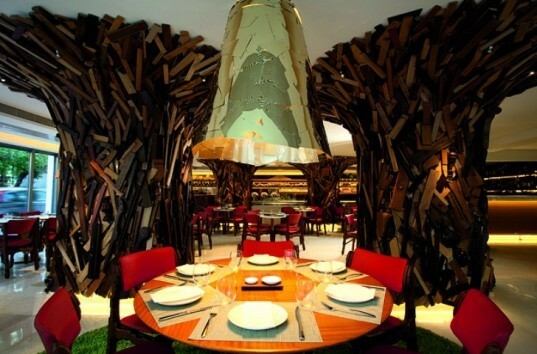 It has 79 rooms and contains handmade chairs, plates, and lamps made from reclaimed materials by the talented Fernando and Humberto Campana from Brazil. Very close to Constitution Square and the Roman Ruins of Plaka, the hotel was originally built in the 1940s. In their first major hotel project, the Campanas kept many of the old hotel’s existing materials, including a black marble staircase. But to give it a sustainable, contemporary uplift, they added new materials – such as solid bamboo floors and tables and corridors laid with bark cloth from Uganda – and hand made several one-of-a-kind decorative and furniture pieces. To realize this project, the brothers engaged undergraduate architecture students from the University of Thessaly, who were especially helpful in infusing the whole project with three underlying cultural themes, namely folklore, the evil eye, and old Athens. Their attention to the city’s socio-cultural context gives this magnificent hotel that little extra human touch. And the hotel is located near many of Greece's most famous historical sites.